I've never been a big fan of the vibes. To my ears, the instrument has a metallic, impersonal sound, produced either by hammering away (Hampton) or by busy fistfuls of mallets (Burton). That's just me, but I never went out of my way to acquire vibraphone records – until one day in Boston back in 1975. 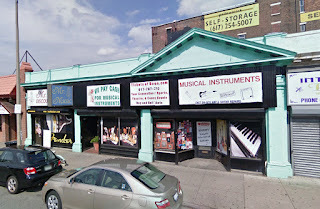 Mister Music on Harvard Ave. – still there today! I was working in a CBS record warehouse in Allston, driving a delivery van that serviced the company's half-dozen record stores in the Boston/Cambridge area. It was a miserable gig, entailing daily life-threatening battles with Bean Town's creative drivers while delivering skids of Captain and Tennille records. Boston in those days was a town on the make and it seemed like everybody was playing an angle, hustling up a buck. There was a guy down the block on Harvard Avenue who had a whatnot shop that purveyed new and used items, jewelry, gifts and assorted trinkets. He personified the town's "gimme" gestalt. 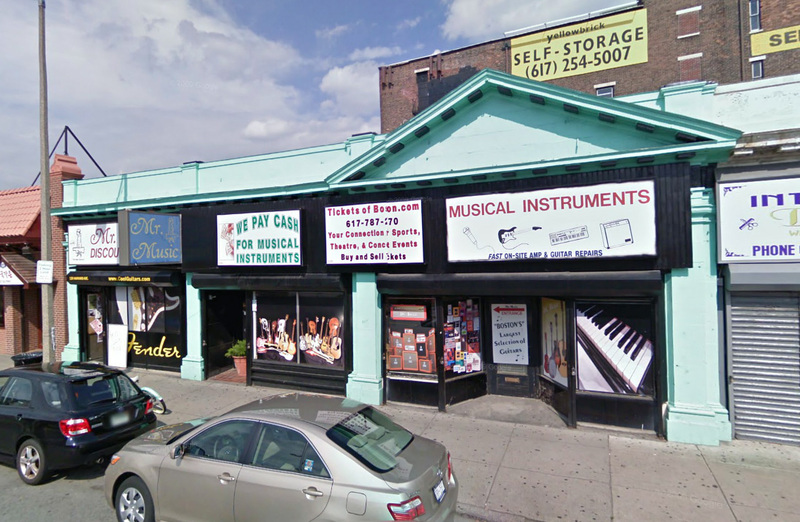 His place was called "Mr. Music" because he had a few banged-up guitars in the window. I kind of liked him. One day I discovered Mr. Music had added several rows of bins. The guy had bought up somebody's collection and had gone into the used record business. 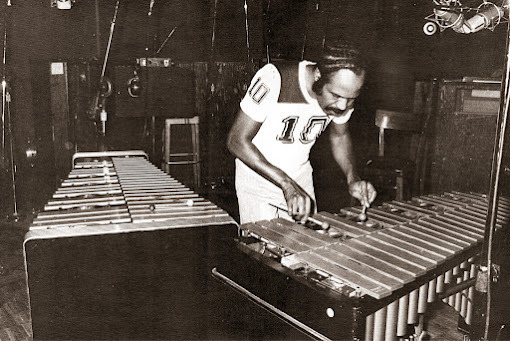 While looking through the albums, I came across several Prestige records by a musician I'd never heard of – a vibes player named Walt Dickerson. One of the LPs had Andrew Hill on it, and I knew his music well and liked it very much, so I took a chance and bought them all. They were a revelation! I heard what the vibes could do for the first time. Dickerson had a unique, subtle sound that could be deep and bell-like one moment, light and woody like a marimba the next. He used short-handled mallets with hard rubber heads that he made himself. He created cascading clusters of sound when he soloed, and his pieces were sometimes long and intriguingly complex. His "To My Queen" was an absolute masterpiece. I decided it was one of the best jazz recordings I'd ever heard. 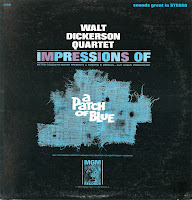 I began looking for more Walt Dickerson records. Eventually I found many more, mostly on Steeplechase, because Walt had begun recording again after about a decade away from the studio. On a trip to Philadelphia and a visit to Third St. Records, I found a fascinating vintage Dickerson LP – the one that is the subject of this post. 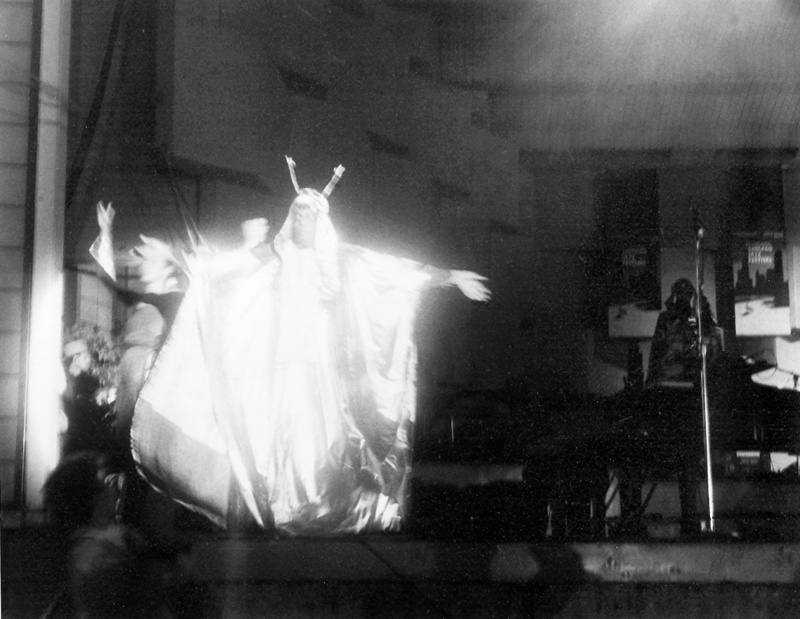 It was on the unlikely jazz label MGM, had been recorded about fifteen years earlier and featured an unexpected sideman – one Herman "Sonny" Blount, aka the legendary Sun Ra. 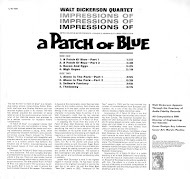 To add to the album's peculiarity, its selections were not Dickerson originals but a loose interpretation of Jerry Goldsmith's soundtrack score for a now obscure 1965 Sidney Portier film called "A Patch of Blue." The film concerns a blind white girl who develops a relationship with a black man and follows the touching and painful consequences of such a liason. 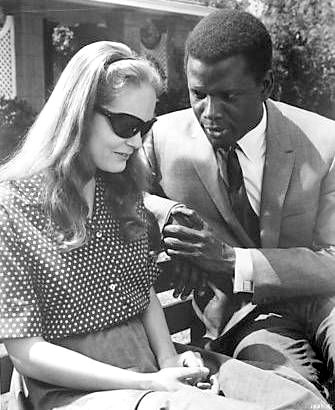 Despite the obvious moral lesson of its plot device, "Patch" is a moving and effective example of '60s agitprop, and the stars shine. So does the music. 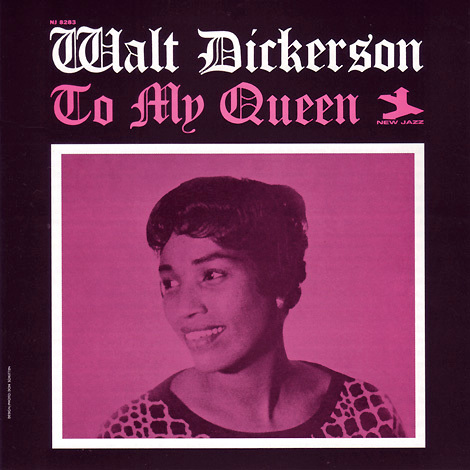 But why did Walt Dickerson record an album of music from a Hollywood movie? With Sun Ra, no less? Because an adventurous African-American A&R man working for Verve named Tom Wilson found the movie struck a chord and he wanted to do something with it. Since the film was an MGM production, and MGM owned Verve, Wilson had easy access to the recording rights. He also had an interest in edgy, envelope-pushing music. He'd been Bob Dylan's producer on "Highway 61 Revisited," had been the first to record Cecil Taylor, and was about to produce the Velvet Underground's seminal "White Light, White Heat" and Frank Zappa's first album. 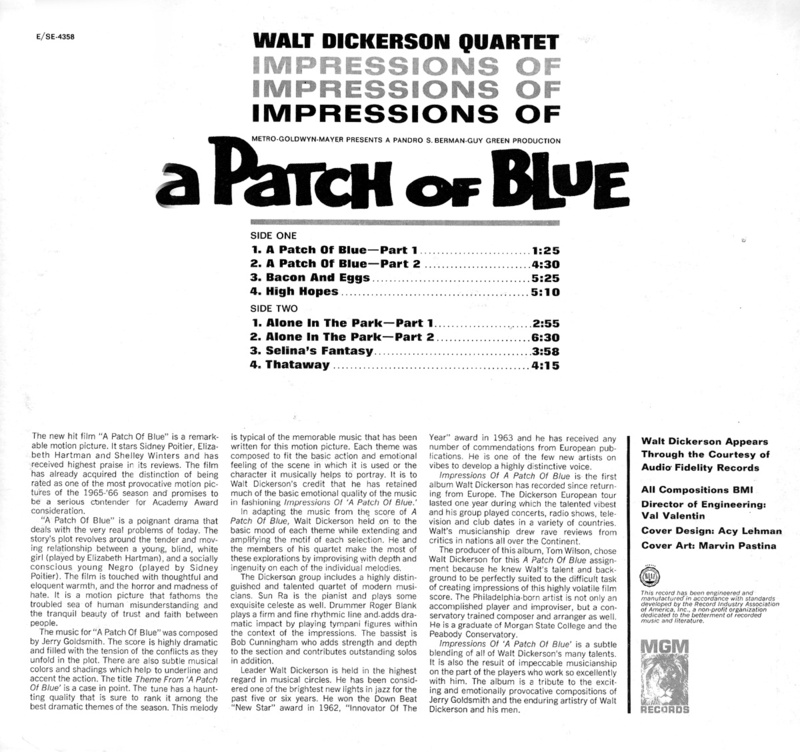 Wilson wanted the idiosyncratic Dickerson for his "Patch of Blue" project. Dickerson had always chosen excellent sidemen for his recording sessions, and now he convinced Sun Ra to play piano and harpsichord on the date. Dickerson knew Ra from Philadelphia, Walt's hometown and, beginning in 1968, Ra's home as well. For the session, Ra eschewed his usual electronic keyboards and stuck primarily to piano, distinguishing the date as one of the very few that allowed listeners to hear him in the conventional role of accompanist. The results of the "Patch" session are excellent. The Goldsmith melodies remain, but this is entirely a Dickerson date, make no mistake. Ra is remarkable, at one moment evoking the stage show at the Club Delisa on Chicago's South Side, probing the Arkestra's spaceways the next. Both Cunningham and Blank, at one time members of Sun Ra's band, turn in yeoman performances. And, of course, Dickerson is magnificent. Ironically, this would be his last recording session for a decade. Only with "Serendipity" in 1976 would he emerge from retirement. As always, these files were ripped from the original vinyl with only a slight cleaning of the sound (there is some surface noise). The record is unfortunately brief – only fifteen minutes per side – but I think you'll agree the music is well worth the download. Walt Dickerson, vbs; Su Ra, p, hrpschd; Bob Cunningham, b; Roger Blank, d.
I"m a big fan of the thoughtful and immensely talented Mr. Dickerson as well and I'm very happy to get the chance to hear this record for the first time. Thank you Gems! P.S. I did see the movie many years ago as well. May you re-up this vinyl-rip on mediafire, please? I love the vibes, probably my favorite instrument. AND, Walt Dickerson is my favorite vibist. Well! this blog is pretty neat!